The Takemori group focuses on the development of mass spectrometry-based proteomics technology and its application to clinical research. Especially, we are interested in developing innovative methods for absolute/relative proteome quantitation using mass spectrometry. 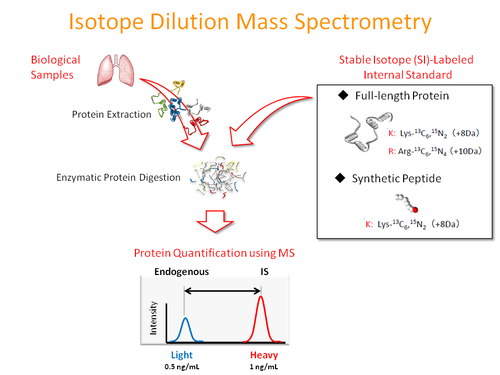 Isotope dilution mass spectrometry has been widely applied to the quantitative analysis of cellular proteins from small amounts of biological samples. Despite its success for analyzing soluble proteins, accurate quantitation of transmembrane proteins remains challenging because of the lack of suitable internal standards. We developed a novel method for the high-throughput synthesis of stable isotope-labeled, full-length transmembrane proteins as high quality internal standards using a wheat germ cell-free protein synthesis system. We synthesized 263 transmembrane proteins by incorporating stable isotope-labeled amino acids in the presence of liposomes. We also established a targeted quantitation assay using the combination of a synthesized internal standard mixture and selected reaction monitoring, and quantified neurotransmitter receptors in different regions of the mouse brain. 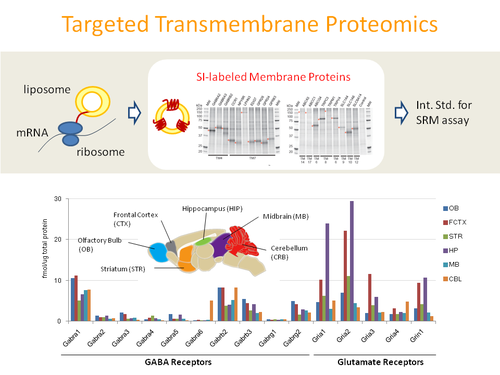 Our study demonstrates that the wheat cell-free system is powerful in the emerging field of targeted transmembrane proteomics. Sample pretreatment, which includes removal of contaminants and recovery of the samples from the storage media, for mass spectrometric analysis is crucial to achieve reproducible and accurate results. The goal of this study was to develop an in-gel digestion method to enhance peptide recovery and reproducibility of the results. 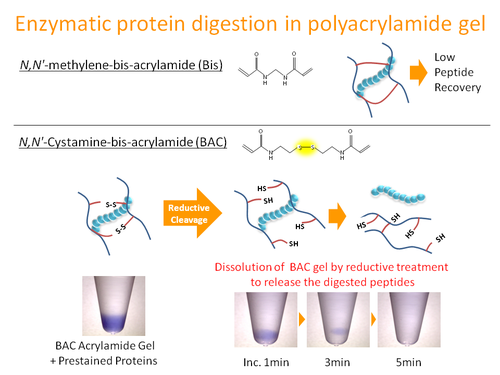 After protein digestion directly in bis-acrylylcystamine (BAC)-crosslinked polyacrylamide gel, the gel was dissolved and the protein fragments released were analyzed by liquid chromatography coupled with tandem mass spectrometry (LC-MS/MS). We found that, compared to other existing methods, the protocol proposed in this study had reproducible peptide recovery and extremely high detection capability for membrane proteins. Moreover, the protein samples stored in the BAC gel were stable for at least one week. Enzymatic protein digestion using a dissolvable polyacrylamide gel and its application to mass spectrometry-based proteomics. J Chromatogr B Analyt Technol Biomed Life Sci. 2014 Sep 15;967:36-40. doi: 10.1016/j.jchromb.2014.07.006. 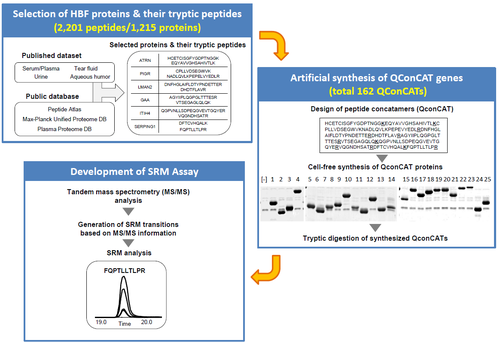 Targeted protein quantification techniques using SRM/MRM generally require the pre-determination of analytical conditions using reliable reference samples. However, comprehensive SRM assay information for the human proteome is currently not available. In this study, we have developed a large-scale SRM assay targeting human body fluid proteins based on previously published proteomic analyses of serum/plasma, tears, aqueous humor, and urine, and synthesized a reference peptide library of 2,201 targeted peptides representing 1,215 human body fluid proteins. Following the liquid chromatography-coupled tandem MS analysis of this library, we successfully developed large-scale SRM assays for human body fluid proteome.